In the first of our own trilogy of Star Wars themed games, ‘Save Vader’ is a hangman-style game in which you need to guess the words to save Darth Vader and his stormtrooper bodyguards. It is quick and easy to add your own words to create your own game. You can instantly play and share your game online, and even add it to your own website, Moodle or PowerPoint presentation. As with all games on What2Learn you can also see the scores your students get in your game – a great way for busy teachers to reduce their marking! Learn more. Try this sample game – the answers are the names of countries in South America. 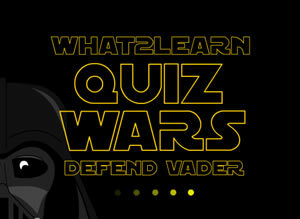 All you need is eight words and you are ready to make your own ‘Save Vader’ hangman game. This will provide an entertaining means for teachers to verify whether their classes can identify the key words for a lesson or unit of work. Alternatively, click here to select another learning game engine from the wide range available at What2Learn.